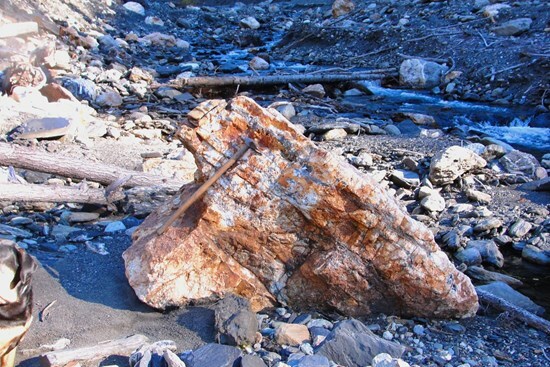 Vancouver, British Columbia--(Newsfile Corp. - February 11, 2019) - Affinity Metals Corp. (TSXV: AFF) ("the Corporation") ("Affinity Metals") is pleased to report on assay results from the preliminary exploration program conducted in October 2018 at the Regal Silver project located approximately 35 km northeast of Revelstoke, British Columbia, Canada. Significantly, as a result of a recent, severe freshet event that totally scoured the upper Clabon Creek drainage, a series of numerous large mineralized boulders were exposed and discovered in the creek drainage over a distance of approximately 3km indicating the strong potential for discovering new mineralized zones upstream and in the immediate area. Robert Edwards, CEO stated: "The Regal Project is an exciting polymetallic property with more than just your average silver mine waiting to happen. This geological system clearly hosts an array of precious and base metals. We already had a significant amount of information on this property from historical work and airborne surveys that point to the outstanding potential of this project, but getting boots on the ground and completing this prospecting and sampling program has allowed us to get our bearings, so to speak, on all this information. Next step is to get a drill in the ground on this property and we are eager to do that as soon as we can this summer. This will begin the process of confirming the historical resource and further outlining the massive potential of this property." The Snowflake and Regal Silver mines were two former producing mines that operated intermittently during the period 1936-1953. The last significant work on the property took place from 1967-1970, when Stannex Minerals completed 2,450 meters of underground development work and a feasibility study, but did not restart mining operations. In 1982, reported reserves were 590,703 tonnes grading 71.6 grams per tonne silver, 2.66 per cent lead, 1.26 per cent zinc, 1.1 per cent copper, 0.13 per cent tin and 0.015 per cent tungsten (Minfile No. 082N 004 - Prospectus, Gunsteel Resources Inc., April 29, 1986). It should be noted that the above resource and grades, although believed to be reliable, were prepared prior to the adoption of NI43-101 and are not compliant with current standards set out therein for calculating mineral resources or reserves. Samples ALLC18-1 to ALLC18-14 inclusive and ALLC18-20 were taken on and in the vicinity of The Regal/Snowflake historical mine workings during the 2018 preliminary exploration program. The Allco Silver Mine is situated 6.35 Kilometers northwesterly (azimuth 300o) from the above described Snowflake/Regal Mine(s) but still part of the Affinity claim group. The Allco Silver Mine operated from 1936-1937 and produced 213 tonnes of concentrates containing 11 troy ounces of gold (1.55 g/t), 11,211 troy ounces of silver (1,637 g/t) and 173,159 lbs of lead (36.9%). No samples reported in this press release were taken on the ALLCO showing during the 2018 preliminary exploration program. The Black Jacket showing was discovered by routine prospecting during 2008. Samples taken on the showing are numbered ALLC18-15 to ALLC18-19 inclusive. This is a raw prospect in that no technical work excluding sampling has been conducted on this showing. The showing is situated 10.3 kilometers westerly (azimuth 281o) from the historical Snowflake/Regal Mine. An extensive airborne geophysics survey conducted by Geotech Ltd of Aurora, Ontario, for Northaven Resources Corp. in 2011, identified four well defined high potential linear targets correlating with the same structural orientation as the Allco, Snowflake and Regal Silver mines. Northaven also reported that the mineralogy and structural orientation of the Allco, Snowflake and Regal Silver appeared to be similar to that of Huakan International Mining Inc's J&L gold project (presently under option to Golden Dawn Minerals) located to the north, and on a similar geophysical trend line. The J&L is reporting a NI43-101 compliant resource of 9.9M tonnes containing 2.4M troz gold equivalent (combined measured, indicated and inferred) and is reportedly now one of western Canada's largest undeveloped gold deposits. Northaven failed in financing their company and conducting further exploration on the property and subsequently forfeited the claims without any of the follow up work being completed. Affinity Metals is in the fortunate position of benefitting from this significant and promising geophysics data and associated targets. 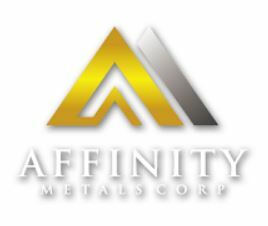 Affinity Metals is in the process of obtaining exploration permits for the spring/summer of 2019 in order to further advance the property, including drilling to confirm historic reserves and to test several other promising targets. The qualified person for this new release for the purposes of National Instrument 43-101 is Frank O'Grady, P.Eng. He has read and approved the scientific and technical information that forms the basis for the disclosure contained in this news release. Affinity Metals is focused on the acquisition, exploration and development of strategic metal deposits within North America. Robert Edwards, CEO and Director of Affinity Metals Corp.
Information relating to the Corporation is available at: www.affinity-metals.com. Certain statements contained in this press release constitute forward-looking information. These statements relate to future events or future performance. The use of any of the words "could", "intend", "expect", "believe", "will", "projected", "estimated" and similar expressions and statements relating to matters that are not historical facts are intended to identify forward-looking information and are based on the Corporation's current belief or assumptions as to the outcome and timing of such future events. Actual future results may differ materially. All statements including, without limitation, statements relating to the Regal property as well as any other future plans, objectives or expectations of the Corporation are forward-looking statements that involve various risks and uncertainties. There can be no assurance that such statements will prove to be accurate and actual results and future events could differ materially from those anticipated in such statements. Important factors that could cause actual results to differ materially from the Corporation's plans or expectations include risks relating to the actual results of current exploration activities, fluctuating gold prices, possibility of equipment breakdowns and delays, exploration cost overruns, availability of capital and financing, general economic, market or business conditions, regulatory changes, timeliness of government or regulatory approvals and other risks detailed herein and from time to time in the filings made by the Corporation with securities regulators. The Corporation expressly disclaims any intention or obligation to update or revise any forward-looking statements whether as a result of new information, future events or otherwise except as otherwise required by applicable securities legislation.